This entry was posted on Tuesday, January 7th, 2014 at 10:43 am	and is filed under Tutorial. You can follow any comments to this entry through the RSS 2.0 feed. You can leave a comment, or trackback from your own site. I wouldn’t be surprised either way. I did have a low battery light, but only noticed it the morning after all of this started. I had switched off power to the furnace so it didn’t have a way to charge all night while it was still hanging out on my wireless network. It was cold leading up to the failure so the heat had definitely been running (and probably charging the Nest). So I’m leaning toward my battery was fine prior to my troubles. One culprit for a low battery (as was explained to me by support), other than what point out in your other post, is he strength of the wifi signal. If it’s weak, the Nest has to use more power. Maybe this has something to do with the RC and RH. This is 24 volts to Red Cooling or 24 Volts Red Heating. I would say it is due to not having a “C” common wire. So I would try wiring to the RH in this case and check to see if this helps. I see in the picture it was wired to RC not RH. Give that a try and that way you dont have to mess with cooling leg “Y”? This completely isolated furnace and now both units play nicely on the Nest. Yes, I’ve read about the power issue and in searching for a solution for this problem it seems like a lot of people have experienced a low battery. I haven’t had any low battery issues, but I’ll probably connect the C wire when I pop it off again to put the Y wire back. right, regardless of the battery charge, it still doesnt explain how disconnecting the Y wire fixed the problem. This “noise” from the Y due to cold sounds a little fishy to me. I’m going to have to see if I can run a C wire. good luck! Yes, I totally agree. Hopefully Nest will release some more info. And thanks, you too! Hi. I came across your article searching for info on the same problem. For the last three or four weeks my system has been short cycling. This is the second time for me – I went through a round of this in March last year. The difference is my system has a common wire installed. The two different technicians that have examined the problem found the limit switch on the furnace board has failed. But they don’t know why. Best guess they have and I can find online is that Nest is stealing power from the furnace via the C wire, which is then causing the furnace to fail. Replacing the limit switch in March worked then – but like I said it failed again about Christmas time. I am waiting for another limit switch to be installed. I am not sure your solution of changing the wiring configuration will work for me. Any ideas or further info? Hello, I am a Nest Certified Professional and have experienced this problem today with a customer. due to excess heat within the heat chamber the limit switch is opening causing the heater to short cycle. When controlling system with a manual thermostat, the system runs to spec. The only thing I can think of is the Nest Thermostat is causing the blower to run at a lower speed, but even that does not make sense. When I find an explainable solution I will post a reply. Hi AirTech, I’d be very interested in hearing what you figure out – I recently moved into a home with a Nest thermostat and after 3 days I awoke to a terrible noise coming from the furnace and witnessed the blower actually catch fire. I have had Certified Nest Professionals replace the entire HVAC system and they determined that the Nest thermostat was not functioning correctly. Now, 1 week later the Nest is throwing the same error it did just before nearly burning my house down. The Certified Nest Professionals came out, replaced the Nest a 2nd time but still don’t know why this is happening. I’m out $14,000 and am afraid to stay in my home. Glad I found your post, as I experienced the exact same problem at about the same time! It went into a seemingly infinite short cycling loop on January 3rd. After a couple of calls to Nest support, the second of which actually had me measuring and reporting voltages across various wires with a multimeter, they decided to blame the problem on the “recent cold snap” and mailed me a resistor (200 ohm, 5W) to install as a shunt on my furnace control board (there are tech installation notes on the Nest site that refer to this to aid in the power stealing). Being in Canada, I informed the tech support that this wasn’t especially cold weather for us, and this unit (1st gen) had performed flawlessly since I got it almost a couple of years ago. In any case, I was willing to install the resistor if it would help. I also convinced them to roll back my software, so that I’m running 3.5.3 now instead of 4.x (which was released in December), but it didn’t help. Ultimately, the “solution” was to disconnect the yellow wire. It remains disconnected, and the thermostat has been working perfectly ever since. I hope they solve this before the cooling season begins. I don’t buy into the explanation that it was the colder-than-normal weather. But the failure seemed to happen too far away from the last software update, unless there was another secret update applied that they didn’t officially mark (I’m really stretching here). I find it curious that a number of us seemed to experience this at the same time though. I received the resistor in the mail, but I haven’t connected it. Clearly, the thermostat is working fine if the yellow wire is not connected, so I don’t see how reconnecting it and then installing the shunt resistor makes it any better. And my wifi signal has not changed (same setup, same location) so I don’t think that’s part of the problem. Interesting. What terminals is the resistor going across? Between Y and C on the furnace control board. I looked for the tech install note on the Nest site, but couldn’t find it, or I would have included the link. When the failure occurred, the battery was dead, so I think that was part of the problem, but I’m still unclear as to how that suddenly happened–especially given the cold temperatures and the fact that the thermostat would have been cycling normally, giving ample opportunity to steal power and keep the battery charged. Yeah, that’s what’s so confusing about this. It was freaking cold. My furnace was certainly not idle. I wish I had paid better attention to the battery when this was first a problem for me. Tough to say whether the low battery was the cause or the symptom. Please let me know if the resistor fixes this for you. I suspect that you have plenty of cold nights remaining this winter to test it. I will, although I’m not in a rush to experiment with it again. I’m dubious of their explanation, which leads me to question whether they’ve really thought this through, or they’re just grasping at straws. In any case, my “heating season” generally runs til April, so there’s plenty of time to try it out. As a side note, I had asked the tech guy if he had a system to peer into the reportbacks from my thermostat. He said he personally couldn’t, but the engineers could, which led me to believe they must be tracking all the vital stats every time the thermostat “checks in”. And if they saw the battery was trailing off, it’d be helpful to shoot me an email and warn me that something might be amiss. Here’s the pro install documentation. In particular, have a look at pages 29 and 30. Well, that seems to settle it. “Intermittent” isn’t descriptive enough, but I suppose short-cycling qualifies. Unfortunately I (accidentally) broke off part of the C wire back to the wall, so I may need to run a new one to make the fix. BLERG. Yikes. Good luck with that. My walls are all closed up now, so I have no hope for running any additional wires. I’ve only got 4. Looks like I’ll have to try the resistor after all. I’ll let you know what happens after I finally get around to it. Has anyone found a permanent solution to this problem yet? I have a C wire and the charge is shown to be 3.9v but the furnace will still only run for a few minutes at a time, turn off for a few seconds, and then begin again. Here’s an update for my situation. As I said, my furnace was short cycling. The furnace technician traced it to a faulty hi-limit switch. This was the second time in 8 months this problem happened. The suspicion was for some reason the Nest was not compatible with my furnace control board, and that was causing the limit switches to fail. So a third limit switch was installed, but still short cycling continued. I switched to a new thermostat – a basic Honeywell, 7 day programmable model – and STILL the furnace was short cycling, exactly the same as when the Nest was controlling the system. So, a little more research and the most likely cause based on the symptoms I was experiencing was that the furnace was getting insufficient return air. A new clean filter (not a 3M super filter, but just a basic one) and I also opened up the tape seals on the joints in the return air duct trunking. And, voila. No more short cycling. I don’t believe that what I have done is the perfect solution, but I can’t find any body who wants to come and do a thorough check. For now I am content. So for all of you with the short cycling, maybe look at other symptoms than the Nest. I have left the Honeywell stat on, as things are working. I miss the Nest, but am satisfied for now with what I have. I had a similar experience… our existing ‘new’ furnace was a Nordyne model which because of an installer error had to be replaced. 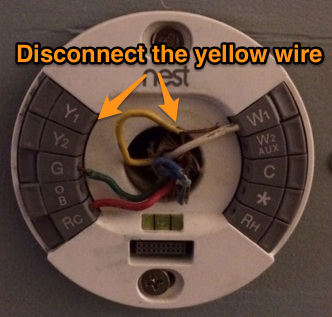 It was working with the Nest, but the original installers only ran 2 wires to the thermostat – and no way to rewire. Of course, new furnace is a Johnson Control model (Coleman) and it didn’t have enough juice to power the Nest and it would short cycle… sometimes the start relay sounded like Morse Code. It has a nice interface, but not the ‘cool’ response that the Nest gets when people look at it. I’d still recommend the Nest, if it works, but for $30 more the Honeywell IAQ does a whole lot more. Perhaps when Nest adds to its line up there will be more reason to go Nest, but for a whole-home solution Honeywell is way ahead in automation. I have the exact same problem. It has been warm here so we haven’t needed heat yet the furnace shirt cycles LOUDLY! Although I have a heat only system with two wires. It is disappointing as I was looking forward to using the information provided by using the nest. Well, make sure it’s fully charged. After some time and reflection I’m not so sure my Nest had enough charge and it just needed some time plugged in with a usb charger. I have the exact same problem. Did you ever find a solution? I currently just have the Y disconnected, but thats not going to help me in the summer. Did you happen to find a solution? We are having the same issue. I had a similar problem with my Nest. My Nest wouldn’t call for heat. Support thought it might have been the backplate. Turns out the Nest was defective. Bypass the Nest by turning off the power to the furnace, attach Rc and W1 together, restore power. See if the furnace works. If it does, the Nest is the problem. As a temporary solution, while I waited for my replacement, I hooked my W1 (furnace) to Y1 (cooling) and turned the temp down. It called for cooling but was actually kicking on the furnace. I’m glad to see this post has been helpful, however, at this point I really do think that my problem was a low battery on the Nest. If you’re experiencing the same symptoms, try to charge your Nest off of its fixture before going to crazy with disconnecting wires! So if I disconnect the yellow wire can I reconnect later in the spring? I’m have the same issue with the short cycling and the nest is on saying that it is “heating” but furnace does not turn on. Then I either have to restart the nest or turn it super low and then turn it up past the setting for it to kick on. Nest is going on 2 years being installed and no issues until last week. Also I’m worried because I’m going out of town in about a week and temps here in the Midwest are in the single digits. If I remove the yellow do I have to tape it or cover it? I have a had a slightly similar problem. Our furnace started short cycling last night and the Nest unit itself was HOT to the touch (and was reading an indoor temperature of 87-ish degrees). I unplugged the unit from the base and the base itself was hot too. I turned off the breakers and let everything cool down. Then switched it all back on and the heat came back. After talking with the Nest technician, he had me feel along the edge of the base for where the head was actually coming from. We determined that it was coming from the area near the Y1 wire input. He believes that one of the fuses in the base blew up, but that the heat should go away if I unplug the Y1 wire while they send me a new base. I’m hopeful (luckily I live in Texas and not somewhere super cold), but this is a bummer for sure. I have the same system setup and wires only my red wire is connected to the Rh instead of Rc. For getting rid of my cycling issue I found that adding a jumper between Y1 and Y2 seemed to fox the problem. Stefen, could you please explain a little more on what you mean by this? My red wire is also connected to Rh instead of Rc, and I’m interested in how to connect a jumper between Y1 and Y2. Also, could you explain how this fixes the problem? Is this a permanent fix, and will the AC still be able to turn on? Thank you. I’m very new to all this. I have old in-wall HVAC units and this solution worked! I thought I was going to have to replace my system. Thank you so much for posting it. This article saved us. The Denver area was hit with near and subzero cold and I was visiting my daughter’s family. The furnace stopped working in the night. They have a 1st Gen Nest controller and I found this article. It solved the problem. It is clearly a severe cold related issues. I’m not sure I buy the solutions in the comments of return air issues. This seems to be outside weather related, and since the fix is to disconnect the A/C, it is logical that something happens to the outside A/C unit in severe cold that causes the Nest issue. Glad this post is still useful! Winter is here folks (in the North, anyway). Stay warm! Came across this post while I was on hold to talk to Nest’s tech support. Figured I’d try disconnecting the AC wire on a whim and the constant cycling stopped immediately. I see there’s a few different theories but no definitely solutions so I may pursue working with Nest’s tech support to see if there’s any more permanent resolution but at least for now I know I can go to sleep without turning in to a popsicle over night. Thanks for this very much. Yes, please post back if you get a definitive response from Nest. I still think at this point the most likely explanation is the Nest’s battery went low and couldn’t charge itself. Thanks for posting this! Another Denver resident here, we got hit with some sub zero temps this week and i spent several hours troubleshooting why my furnace kept short cycling and eventually locking out. Disconnecting the yellow wire at the Nest fixed the problem. Have the same problem and disconnected the yellow wire. This will be a temporary fix correct? How do I permantly fix the problem? Same boat, two furnaces, two nests. Upstairs furnace installed without issue. Upstairs furnace is older, but with the same 4 wire setup and thermostat as the downstairs. ACs are located on the ground outside by each other. Downstairs main floor furnace immediately went into one second cycling. On, off, on, off, I thought the motor was going to burn out. Before installing the nest I had absolutely no problems. I performed regular maintenance on both units. I’m a little advanced due to military electrical training. I can replace almost any component on the circuit boards. I found this article and disconnected the air conditioner wire. Furnace went right back to normal. It is a cold night, but not to bad. It is 37 degrees F. It was in the negatives just days before this. The battery on the nest appears fine, but was not checked before disconnecting the AC wire. The only difference I have in my setup was that I removed a jumper between the two Rs as per the directions from nest. I wonder what returning this would do. If I find out anything else, I will be sure to post. Forgot to add that the upstairs install went fine. The nest worked correctly on the first try. My previous upstairs thermostat kept saying low battery even after replacing the batteries. After leaving them out for a few days and then replacing them, it fixed the issue. But then I had the same problem with the downstairs thermostat. My fix didn’t work this time. So, I replaced the downstairs thermostat with a Nest thermostat, only to encounter the issue with short cycling. After failing to figure out what was wrong, I called Nest tech support. They couldn’t help either. They referred me to a Nest Pro heating and air company (Young’s Heating and Air in Citrus Heights, CA) who solved my problem. In case it’ll help others, here’s what they did to fix the issue. They had to connect a blue wire (referred to as a “common wire?”) which wasn’t previously connected to the HVAC system or thermostat. In addition, one of the Nest options was set incorrectly, which forced my AC and heater to turn on at the same time even though I wanted only heat. One last issue was one of the power wires connected to my HVAC wasn’t properly connected. They fixed that also. Now I’m up and running with two Nest thermostats for upstairs and downstairs. I had a similar experience but a different solution. I have a single furnace that is a 2 stage and runs on natural gas. My furnace was short cycling and wouldn’t bring up the temperature more than a degree or two. Occasionally when I would walk by the thermostat it would say that the wiring had changed. I would hit continue and then done and the message would go away only to return again later. I called their support line and after sitting on hold for 43 minutes I was connected to a very helpful technician. She had me disconnect the C or common wire. In my case this wire was blue. Once I did this the short cycling stopped and my furnace kept running. I taped the end of the wire and pushed it back into the hole. It’s been several hours now and everything seems to be working well. I have 2 nests. 1 for heat and 1 for AC. Once every few months so far has happened twice my furnace radiator style on gas will keep cycling. I usually hold down the heat nest for 10 seconds to do a system reset. I was thinking perhaps my AC nest may communicate to the heat nest and shut down because diff areas of the house may be hotter or cooler. Can anyone confirm this? My AC nest is shut off but still on. So I am not sure. Let me know if there is a solution thanks. I wanted to reply too and say thanks for this post. Our 2nd gen Nest went out too during the recent cold snap here in Colorado. I initially assumed it was something wrong with the furnace but after reading over this post I figured out we were dealing with the same issue and was able to get the heat going again. I haven’t looked any further to see if there’s a resolution for this yet but I was definitely happy to get the house warmed up that night. Wow, the original post here is 3 years old and Nest still has this problem. Unacceptable! We had a cold snap here in Toronto, Ontario and my furnace was short cycling. Luckily this post was up and the suggestion worked perfectly. Again, unacceptable, I wonder if this is a bad sign of having been bought out a few years ago. The development of current and future products seems to be lack-lustre. This has helped me out a few times now. I’m ultimately getting rid of the Nest. I’ve verified it’s not a power issue, furnace is fine and runs when I swap out with another thermostat. Disconnect the Yellow wire in extreme cold weather fixes it for me. I’ve been through the low batter fiasco in the past, this is not the problem. I’ve gone through charging it to see if it would work and it doesn’t. Simply disconnecting the yellow wire and it fires right up. My furnace keeps short cycling when the nest is hooked up. I don’t not have a common wire hooked up to it. Would a common wire fix my short cycling problem? Hi Mike, You’ve probably moved on from this since it’s been almost a year but I thought I’d reply anyway. The common wire is simply an alternative power source for the Nest to draw power from when it’s battery is low. If your cycling problem is due to a low battery then the common wire may fix it. You can rule out the low battery issue as a possible source for your cycling problem by checking the settings > technical info section of your Nest app. Per an earlier post, apparently anything below 3.7 volts is low. If your Nest is at or above 3.7 and your furnace is still cycling, that would suggest the cycling is not due to the Nest turning on the heat to get power to charge the battery. You are seriously DA MAN!! Thank you for posting this!! I was ready to take a hammer to my Nest after waking up to (or coming home to) my furnace short cycling multiple times with no clear rhyme or reason for it. I appreciate you taking the time to pass along your knowledge!! For the record, your solution also works if you disconnect the green wire. Update: Disconnecting the green wire stopped the short cycling, but a new issue has developed. Now my furnace will only come on randomly. It’s absolutely maddening. I’ve re-set the nest multiple times, turned off the automatic scheduling multiple times (it re-starts). I finally just twisted the red and black wires together to actually get the house warmed up while I decide if I want to re-install my old thermostat. I am not a fan of the Nest right now. I have the short cycle problem on HEATING and AC, but not all the time. When happens I OFF the next using my Mobile App and start again. It works but the problem comes back after some time. Lack of a common wire of not enough power may make sense. First comments were in 2014 now it is 2017 June??! I would expect NEXT to be specific with their findings, as many of us see this problem. Not good for future business. Thank you sooooo much! I absolutely appreciate your post! It works! And we can be warm again! Returning my Nest. Unable to resolve issue with power cycling, even after adding a common wire. We don’t have A/C so there was no yellow wire to remove. I just got my 3rd gen Nest thermostat and I’ve been having the same issue. I tried trouble shooting the issue on my own and then with the Nest support people. It turns out that my heater doesn’t apply though power to the Nest thermostat and that’s what’s causing the power cycling. Nest offered to reimburse me for having a tech correct the installation by either repurposing the fan wire to be an additional power wire or running a new common wire to my Nest thermostat. Thank you so much! you saved me from freezing!! God bless you! After numerous phone call to nest support, replacing thermostat with one nest support sent me, having my oil burner company come in and try to figure out short cycle issue and battery drainage I came across this article. Once I removed AC issue fixed in minutes! I am located in NY and this week we are having record breaking freezing temperatures, last night was 8 degrees I was all set to go back to old thermostat, then came across this article, have no idea why nest support did not tell me about it, but I did send link to the support person that was helping me. Thanks Again, hopefully nest will fix in a later version. Woke up to a freezing house this morning and the nest was basically just short cycling the fan off and on (furnace was not coming on). After jumping wires to get the furnace going and the house warmed back up, I charged the nest via USB for 2 hours just to make sure that wasn’t source of the problem. Even after factory resetting the Nest the problem still persisted however and I began looking for my old thermostat, assuming the nest was just DOA at this point. While waiting for a reply from my wife as to the whereabouts of our old thermostat I came across your article. 5 minutes later I was up and running and felt compelled to come say thanks even though this is 3+ years old. Happy it helped! Stay warm! Just got off the phone with tech support (after a nice hour and a half hold time on this -5 degree night). Was going to try the yellow wire fix but was hoping there would be a better solution 4 years after this article. Apparently not… The yellow wire was the fix. Thanks for the article. Think Nest should just link to this on their support. Might save them a few phone calls. Thank you! Saved me from some frozen pipes! Nest should point this article while they work on a fix. .. And here I am, a new Nest Gen3 owner, just installed it tonight and it is and has been verrry cold out here in Toronto for many days now… My Nest has been short cycling for hours until I found this post… It was getting cold in here. The disconnection of the Yellow wire turned the heat back on, but now I should be sleeping and not feeling so secure about the statua of the Nest and not having any time to deal with it in the morning. But thank you so much for this post, lifesaving info here rduell! YOU NEED A COMMON WIRE!! I took a look at my furnace, and the C wire is wired but goes to the AC unit outside. Can I simply add another C-wire on the furnace for the Nest on top of the current AC unit C-wire? Gen3 since 2015…now Furnace fan Short cycling when NOT calling for heat.Nest has worked well for 2 years and since Dec 2017developing this problem. Wiring: Y1 black (AC), W1 White, G green, Rh Red. Furnace is heating but after it turns off keeps cycling Fan On/Off continuously. Discovered when pulling Y1 (AC) wire furnace behaves normal. Spent 7 chat hours with 3 Nest agents over 2 days recreating my problem….it is a known issue but they insisted it was necessary to determine root cause. Finally they admitted that this maybe caused by the AC unit since Nest uses the Rh and Y1 to charge the battery….If there is no Y1(AC) because in winter the AC is turned off or not activating due to a Safety switch, it will use the W1 wire….and causes the cycling issue. I told them it was BS, since I run my Fan for 30 minutes each night to charge the battery and it never used to be a problem. Ultimately they admitted that this problem has now developed….and requires a “Common” wire to be installed, which they are willing to reimburse. Bottom line…the agents may or may not be knowledgeable and force you to go through a lot of non-sense…to ultimately admit that they have this issue. Pulling out the AC (Black or Yellow) solves the problem until the summer…..So it gives me some time to install a Common Wire to see if this will fix it. Needless to say I was P#####t.that it had to take 7hrs to resolve this . It seems like I am the newest member to this club. My situation sounds similar to many described here but I wanted to clarify what seems to be causing my issue and what the possible fix might be. Then, I leave for work this morning and on my way out the door I notice the system is short-cycling on and off. I have to catch train so I leave anyways. I begin to monitor from mobile app, temperature drops down from 69, 68, 67, 66 however the app shows orange that it is heating to 72 degrees. Finally, after no luck with the Nest support lines, I decide to shut off the heat from the app and re-turn it on to 72 degrees. The system turns back on and begins to hear after I manually adjust…it looks like it has returned to 72 degrees. 1. The A/C wire not working with the system. (Supposedly this is due to extreme cold and will work fine once connected in spring/summer?). 3. The system is not heating when it says it is heating and will randomly stop maintaining heat (almost as if it is not properly communicating with furnace). So it’s now January 2018 and we just installed a Nest E, and ran into same cycling issue (and the customer service still just recommends releasing the Y wire). Because the unit is brand new, I’m returning it and crossing my fingers the alternative EcoBee doesn’t have this issue. I really don’t want to connect/disconnect wires every spring and fall…adios Nest. We’re figured out the issue on ours…at the actual furnace the common (blue) wire wasn’t plugged in. Apparently for some thermostats it’s not needed…but for the new smart ones, it IS. Worth a shot to take a look at what wires are plugged into the actual furnace! And, we ended up with an EcoBee 3 lite and really like it. Love that you can have remote sensors in “problem” rooms. Our kids rooms always run colder/hotter than the rest of the house, so this gives me peace of mind that they aren’t too cold/warm at night! You’ll be fine with the EcoBee as it comes with an adapter for all wires.. But for the Nest, you need to install a common C wire for it to always work year round. Just had the same problem with mine… 1:30AM woke up freezing… simplest solution if you have an R,Y,G,W set up is replacing the G(Fan) wire in your furnace to C(Common) and do the same in your Nest base set up. The Fan(G) is not used in most systems that are less than 20years old, because Heating and the A/C turns on the fan at default even if you got rid of the wire completely it would still work. When I swiched the G(Fan) wire in both places to C(Common) the problem seams to have disappeared and no new wires where needed to be fished through the walls and etc. As this is the month of February I’m still curious how the system will behave in the summer. Let me know if your problems still persist even after trying this. I have seen in other instances moving the g wire to c made things work properly. The g is only for a fan to run from what I can tell. If the equipment you have installed the nest on isnt older than 10 plus years, you won’t need it. Just make sure to change the wires in your corresponding unit to match the changes to the t-stat. TL:DR your 3rd gen Nest may require the “C” wire to work properly with your HVAC. I was having a similar issue upon installing my 3rd generation Nest. I’d put all the wires exactly where they go. We have a Carrier gas/forced air with dual zones (2 thermostats, but only 1 Nest). The outside air was in the 50’s (normal temperate northern CA winter). The AC compressor would kick on for several seconds then shut off. Then the heat/fan would run for a couple of minutes. Then it would shut off and repeat the AC->heat/fan cycle about 5 minutes later. I didn’t notice it was cycling initially and after a couple hours the Nest battery was dead and the screen wouldn’t turn on. I charged it via USB overnight, but had the same cycling issue the next day. It wasn’t long before I was getting low battery messages. Upon finding this thread I tried removing the Y1 just to see what would happen. I had the same cycling issue, but this time the AC compressor didn’t kick on at the start of the cycle. I plugged the Y1 back in. Next, I decided to test and see if installing a “C” (common) 24v power would help. Fortunately, we had an extra blue wire that wasn’t hooked up to anything on either the thermostat or furnace end. On the furnace end we have a dual zone controller that the wires feed to. It was clearly diagrammed and labeled where the 24v common wire went. I hooked up the blue wire to the common and then plugged it into the “C” on the Nest base. It fixed everything. The Nest is working perfectly now. As soon as I started the testing phase I could tell it was working properly. Previously during the Heat, Fan, Cooling test it had come on, but in the cycling fashion described above. This time the AC compressor turned on only during the cooling test and stayed on for the duration of the test. The air got warm during the heat test and circulated during the fan test. It’s been working perfectly ever since. Ok so can someone confirm for me, as I am not a licensed HVAC technician, is it ok to have the needed C wire attached to the thermostat / furnace and another one shared at the furnace C wire node that powers the air conditioning unit outside? Late reply but yes you can terminate two wires under the C terminal screw at the furnace board. That’s all. No disconnected wires necessary. So far so good. The endless cycling stopped right away. Guessing the AC wire is active and keeps the Nest powered in that mode. Hopefully this will help someone else too. Thanks Ryan for the original diagnosis method and other folks on here too. I didn’t read every post so apologies if this is a repeated solution. SB – trying that as we speak as I have the short cycling and random E195 errors now that the weather has turned cooler. So after a day in dual mode, SB’s solution above works! No short cycling or error codes. For reference, I have always had a C wire connected and only experienced issues in heat mode. When you combine the Red and White wires by twisting them, where do they go? Shorting those two wires is just a test to see that your furnace will turn on. If it turns on go ahead replace the wires, if it doesn’t your problem may be with your furnace rather than your thermostat (probably should replace the wires here too). Same problem. Same partial solution. Pull the yellow wire. In heat mode the blower would cycle 3 seconds on, 2 seconds off, repeat. I checked my red to black C voltage. 28 VAC and the nest has a full battery. I shorted red to white and the furnace ran normally. I disconnected the yellow and the cycling stopped. The cold snap reason is BS because I’m in Florida and the problem started when I turned on the heat at like 60 F. It was 50 F last night when I pulled the yellow to “fix” things. Still looking for a solution. I’ll call Nest but that’s probably futile from what I’ve read here. Did you talk to nest yet? I’m working on my dad’s thermostat and the temp outside is 38… doesn’t seem cold enough to be problematic. Hey all. I wanted to leave the solution for my E195 and delay for 3 minutes nest issues as this is the best thread on the issue I have found. Short answer – furnace was overheating cause it was dirty. I had issues with me nest last year. It kept doing the E195, the delay for 3 minutes, and would say low battery. I took it out and just put in my old thermostat and it worked fine. I read about putting in a common wire but couldn’t find away into that part of my furnace and I had to work on other things. This fall I decided to get it working and forced my way into the bottom of the furnace(turned out to be a bit rusty). I connected the common, reconnected the Nest, and all was great for about 4 weeks. They it started with the 3 minute delay and E195. I’m not sure if it counts as short cycling. it was about a 4 minute cycle and my house would only get to about 60-65. I tried removing the yellow like this post said but it no luck. Nest support said “the common wire was not grounded correctly and the issue was with my furnace”. I have no idea how you would ground a common wire but any ways, I put on my old thermostat again and it went back to working fine. I called out an HVAC guy. He said the furnace was overheating and they cleaned the inside of my furnace and cleaned the flame sensor. Nest is now working fine. So it looks like the Nest throws the same error code for a wide variety of issues. The nest was trying to space my furnace from issues it looks like, just wish there was a way it be more descriptive with it’s codes. Funny you should bring that up, I had the same issue with my furnace (moved some time ago, so different furnace than what’s in the post). When removing the wire didn’t work I started poking around inside my furnace’s control box. Mine had a code system (i.e. so many fast or slow blinks means xyz) that lead me to take that flame sensor out and clean it off a bit. Slightly more advanced than removing the Nest, but still not too terrible. I came here to post the same thing as rduell. I had read this post at one point and was convinced it was something wrong with the Nest, but I finally tried cleaning the flame sensor and it fixed the problem. It’s pretty easy, I followed this guide: https://dengarden.com/appliances/Save-Money-Fix-Your-Own-Furnace. Mine didn’t even look visibly dirty so I didn’t think it would help, but it did. I used a little vinegar on a piece of cloth because I didn’t have any cash or sandpaper handy. Worth a try if you have a gas furnace and none of the Nest troubleshooting helps. I’ve been having the same issue. Furnace would turn on for 10 minutes then start short cycling. Changed the furnace filter but no help. Called nest support and they think it is a battery issue and offered to reimburse me the cost of installing a c-wire. I checked the battery though and it’s above 3.7. I tried to remove the Y1 wire but I get an error code. Not sure what else I can try. Hi there, Can someone provide some guidance…..
We received and installed two nest (3rd gen) on boxing day. We have two furnaces. We made note of where the previous wires were connected to old programable thermostats. 1st install went well and nest is operating as expected. It is a 4 wire unit (Blue/Y1; Green/G; Red/Rc; White/W1). We do have an air conditioner, but it is not operational and where we live, hardly ever needed). We have eliminated the furnace being the cause. We have confirmed the 2nd unit (that is short cycling) has enough power (3.86v). Most of the replies above (very helpful btw) are dealing with 4 wire units. I don’t know what any of the codes on the wiring harness mean (ie W1; Rh; blah blah), and it could be we wrote down the connections wrong from the previous thermostat. Also I don’t know which wire does what – so I don’t know what to try. I was going to return the Nest today, thinking it may be defective, but if we have it wired incorrectly, perhaps we could try something else first. Please let us know if the new Nest helped! Sorry I should have posted an update. New Nest arrived and we continued to have the same problem. We called an electrician in and he was able to get us power to the thermostat and now it is operational. I’ve sent an email to Nest to see if they’ll reimburse for the electrician and as if today I haven’t heard back from them! Just an update. Nest is paying my electrician bill. Which is a nice gesture and one I wasn’t actually expecting. The other Nest on my other furnace is working fine, it doesn’t have a common wire either, but is a 4 wire system. I don’t know why that one works and the other didn’t (other than different furnace brands). Anyways thankful everything is now working especially since the cold weather is about to migrate from the east to the west. 2019 and this is still a problem. Thanks for the yellow wire advice. You are a saint for posting this! It’s -30 in Chicago today and my furnace kept short cycling and our house was freezing. After a lot of trial and error (and tears) we discovered your post and it SOLVED THE PROBLEM. Thank you, thank you, thank you! We’ve had a Nest for over a year and today I noticed the furnace short-cycling. I assumed the problem was with the Nest, but my husband looked up some info that said a clogged air filter can cause a furnace to short cycle. We change our air filter monthly, so that didn’t seem likely. We tried rebooting the Nest to no avail. My husband went down to look at the furnace and try turning it off and back on, too, when he noticed that our whole-house humidifier had a blinking light indicating a dirty filter! He turned off the humidifier and the furnace is no longer short-cycling! So, if you have a whole-house humidifier in line with your system, you may want to check on that if your furnace starts to short cycle. Short Cycling is a setting issue, part of the setting is on the Thermostat and part is in the Nest App. In the application the default preheat is 5 hours what you have to do is put it in “0” and the problem is solve. If you have a radiant floor heating system you can use the preheating settings. Hope this help. Glad it helped! Stay warm. 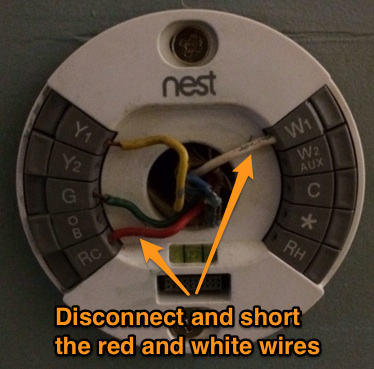 The solution to the Nest thermostat is the “C” common wire as most recent posts state above. I located an awesome website that comprehensively covers “smart” thermostats. It makes it VERY clear that Nest thermostats need the “C” wire. Here is the site —-> “http: // smartthermostatguide.com/no-c-wire-install-a-nest-thermostat-at-your-own-risk/” <—- You will need to remove the spaces before and after the "//" in order for the link to work. Do you have any similar results with Trane units? Just wanted to say I’ve had this problem pop up on three separate occasions now, during ‘polar vortex’ type weather events where outside air was less than 5F. Each time, disconnecting the yellow wire has done the trick and allowed things to continue normally. Such a strange problem – but add me to the list of people for who this trick works! Depending how many thermostat you have open anyone on Nest app go to settings of top right open it . turn off true radiant ( by default is on and with a preheating of 5 hours) and turn off Eco temperature ( by default is 40 degrees ) and this will fix your short cycle on your furnace. Or at least did it on mine.